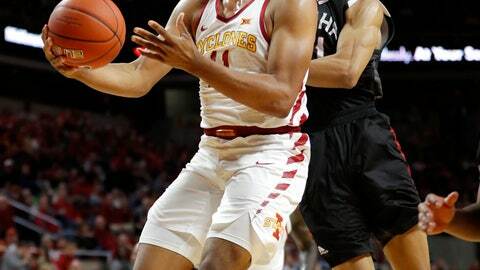 Iowa State showed no signs of fatigue after spending last week at the Maui Invitational, scoring the game’s first 11 points and jumping ahead 41-28 by the break. Freshman Talen Horton-Tucker then buried back-to-back 3s to make it a 60-36 game with just over 14 minutes left. The Cyclones outrebounded the Mavs 46-33 — with Jacobson, a Nebraska transfer, again leading the way. “To be honest, I have no idea,” Jacobson said of his role with Lard expected back. Iowa St: Haliburton has looked like he belongs in a Big 12 uniform from the moment the season started. But this was the first time he completely took over a game for a stretch, scoring 16 points with three rebounds, two steals and a block in the first half alone. Haliburton didn’t score in the second half, but Iowa State cruised anyway. “I’m just trying to share the ball and trying to make the right play,” Haliburton said. Iowa State outscored Omaha 16-0 on fast-break points. …The Cyclones held Omaha’s leading scorer, Zach Jackson, to 13 points on 5 of 12 shooting. …Iowa State committed 14 turnovers. …Nick Weiler-Babb didn’t score in 26 minutes, but Prohm said that his senior point guard had been under the weather in recent days.